From meat grilled on the table before you, to boiling hot stews, to chilies and pickles, Korean food is almost impossible not to fall in love with. In this Korean food guide, I’m going to share with you 29 of the best tasting dishes you should eat. I’m going to start this South Korean food list with not really a dish at all, but something that is critically vital and quintessential to any Korean meal: KIMCHI. While there are many different kinds of kimchi, the most common version is made with napa cabbage that is preserved and lightly fermented in bright red chili flakes. 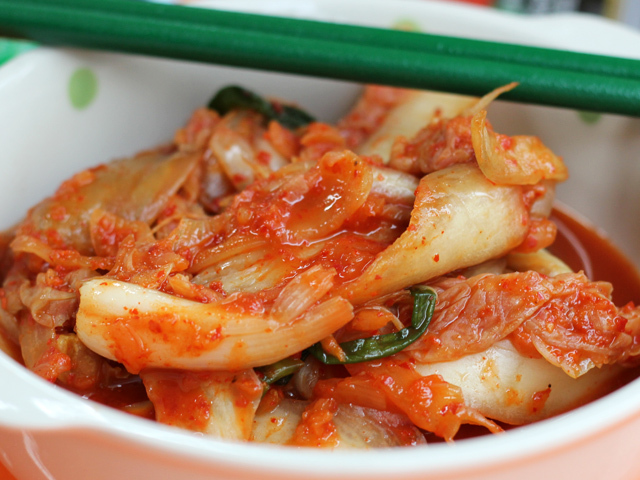 Love kimchi and you’re on your way to being a Korean food connoisseur! There were quite a few meals in Seoul where I settled for nothing more than rice and kimchi (and I was very happy). Cost – comes free nearly every restaurant you eat at, but I bought a huge sack of homemade kimchi to eat with rice for 5,000 Won ($4.39) – it must have been 1.5 kilos! 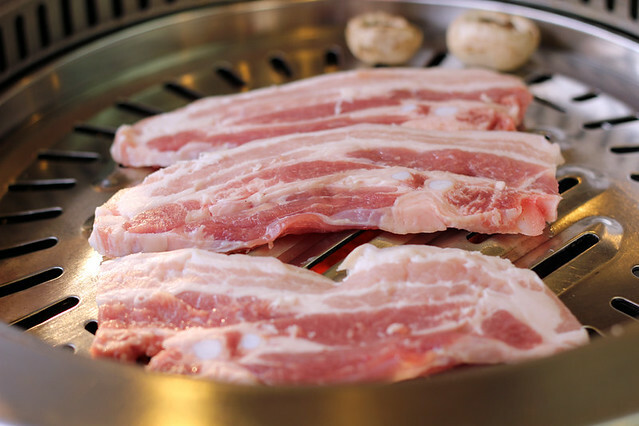 Fatty slices of pork belly grilled before your nose is a South Korean foodie favorite. A few slabs of this ultra-tasty pork along with garnishes of lettuce leaves, garlic and chili paste, and you’ve got a flavor to cherish. 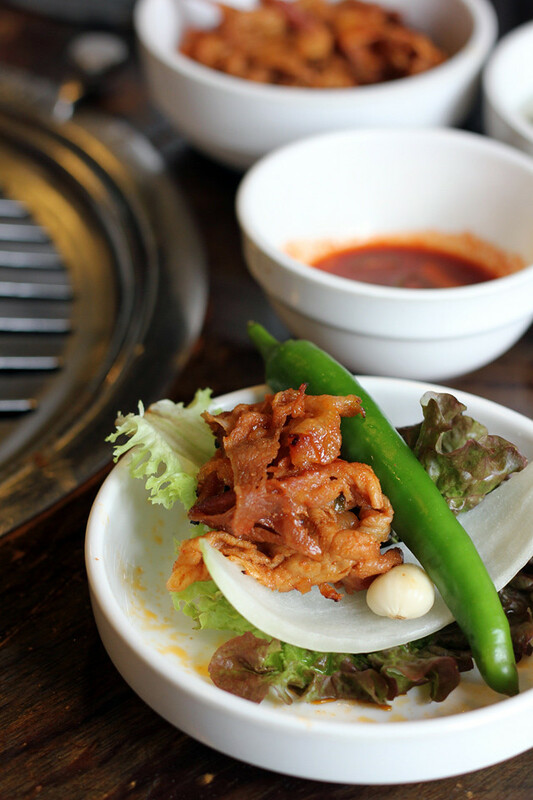 It’s not the healthiest South Korean food, but if you are a lover of pig, samgyeopsal is something you can’t miss eating when you’re in Korea! Another famous Korean specialty barbecued meat is known as Bulgogi. 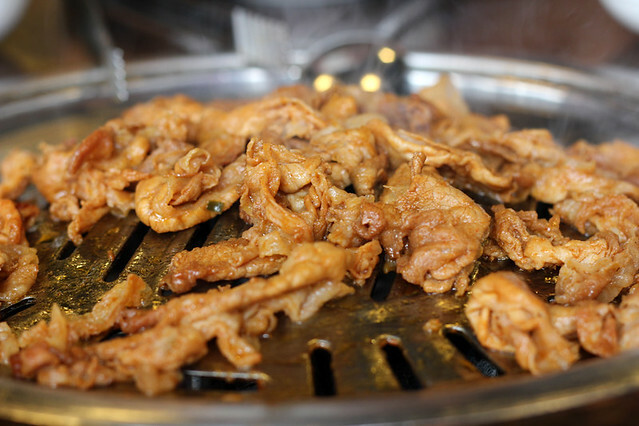 While it’s normally made from beef, bulgogi can also be made with thin strips of pork or chicken. Before the meat is grilled, it’s marinated in sweet soy sauce with lots of garlic and sesame oil. The version I ate above was from the New Valley restaurant in Seoul that specializes in pork bulgogi known as Dwaeji Bulgogi. As a Thai meat lover, this daeji bulgogi was a dish I couldn’t get enough of – highly recommended! There’s no better way to spend an evening in Korea than sitting around a personal grill munching down a traditional Korean barbecue feast. 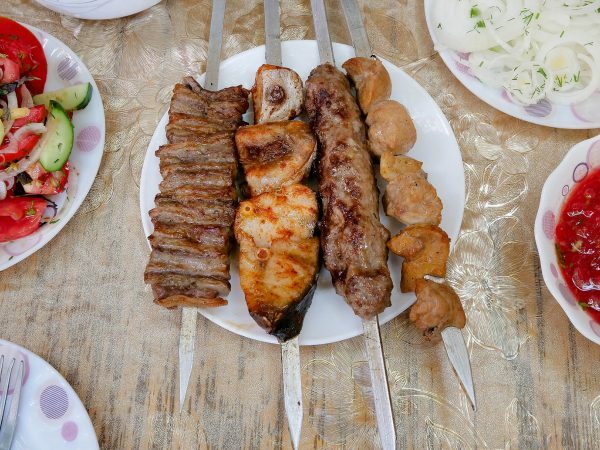 Order a few plates of meat, and you’ll be delivered a vast array of side dishes and the all-important pieces of lettuce, garlic, peppers, and chili pastes to fashion little meat wraps. Note: One of the interesting things I learned eating Korean barbecue in Seoul was that you must order 2 or more plates of the same meat – you can’t order just 1 plate. In other words, if you go to eat with just 2 people, you’ll have to get 2 plates of pork belly, or 2 plates of beef – not 1 plate of pork belly and 1 plate of beef. The famous Korean hangover stew is something I was really excited to sample when I arrived in South Korea. It came in a piping hot earthenware dish. There are a number of different variations of Haejangguk, but the one I ate was made with pork spine bones. The broth was rich and spicy, flavored with tender chunks or fatty pork and Korean chili paste. Known to cure hangovers, after eating this masterpiece of Korean flavor, I suffered a Korean food hangover and all I wanted to do was collapse on a sofa and take a nap. One of the tastiest things I ate in Seoul! 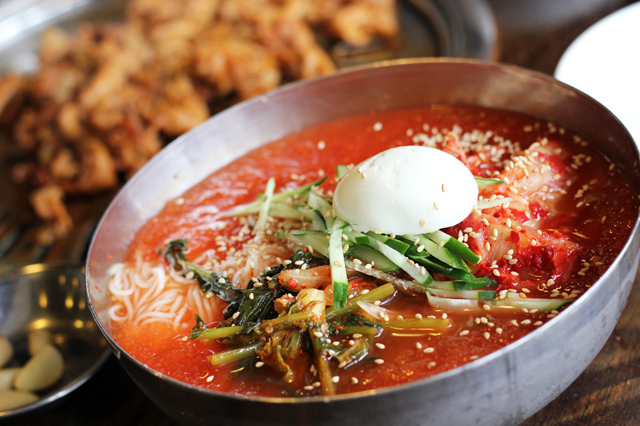 A flaming hot pot of Sundubu Jjigae is a flavorful Korean dish. Made with super soft tofu, a few bits of seafood, addictive kimchi soup, and an egg thrown on top, there’s not much else as comforting on a cold rainy day. This tofu stew is best enjoyed with a side of steamed rice and a few pickled vegetables. 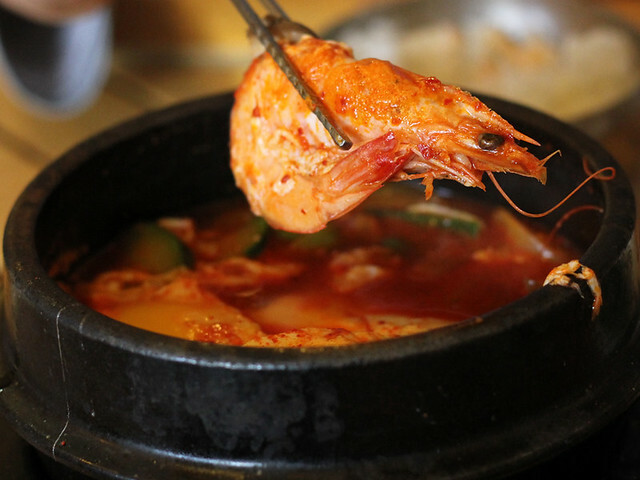 Among the repertoire of South Korean jjigae hot chili infested stews is the massively flavorful seafood variation made with whatever kind of seafood is on hand all boiled in a hot earthenware pot of goodness. South Korean food is unbelievably delicious, but if I could choose just one thing to eat over and over again, it would have to be kimchi jjigae. I’m not alone, it happens to be one of the most beloved everyday dishes to eat in Seoul and it’s one of the most affordable complete dish meals to eat in Seoul. Napa cabbage kimchi is boiled with chunks of fatty pork and a few other seasonings and ingredients and then brewed into a stew that boasts intense flavors and will have your belly craving for more! 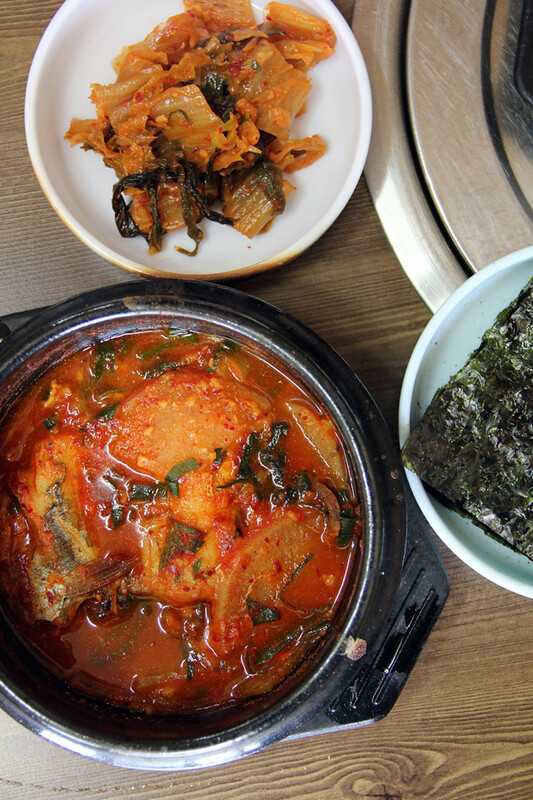 As a lover of fish, it was a joy to eat the same delicious Korean kimchi soup base made with fish. Though the fish was filled with bones, the flavor it provided was nothing short of outstanding! 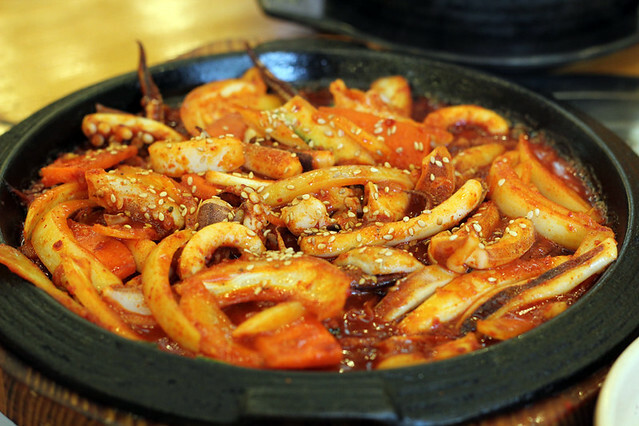 Koreans have a love affair with octopus. While I wasn’t able to try the famous live squirming octopus tentacles while in South Korea, I was able to get a taste of chopped octopus stir fried with a few assorted vegetables in red chili paste. The flavor reminded me of Thai pad prik gaeng, heavy on the sweet red Korean chili paste. 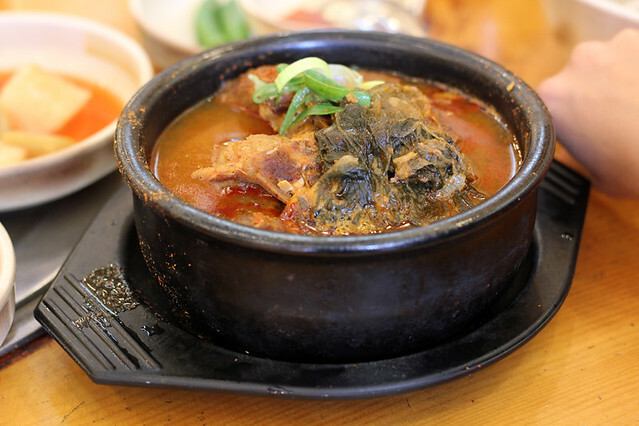 Ox bones simmered on low heat for hours and hours is the highlight of Korean seolleongtang. The dish is served plain, a few light noodles, slices of beef and green onions. The broth is delivered to you unsalted and unseasoned so it’s up to you to add salt, pepper, chili paste and extra green onions to your own taste. The dish consists of rice on the bottom, a few different kinds of sauteed vegetables, an egg, and toasted seaweed flakes and sesame seeds on top. 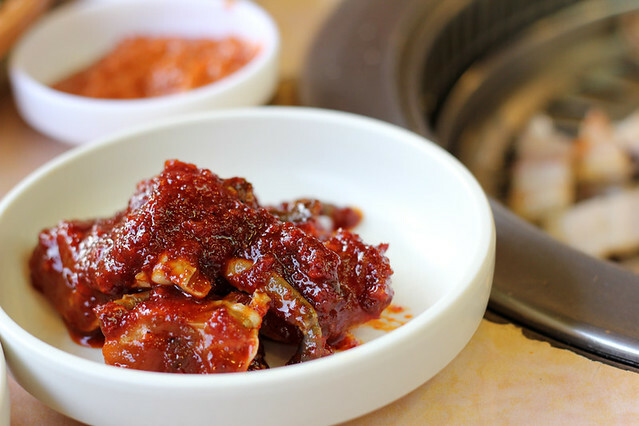 If it’s not salty enough, you can normally add more gochujang chili paste to make it tastier. 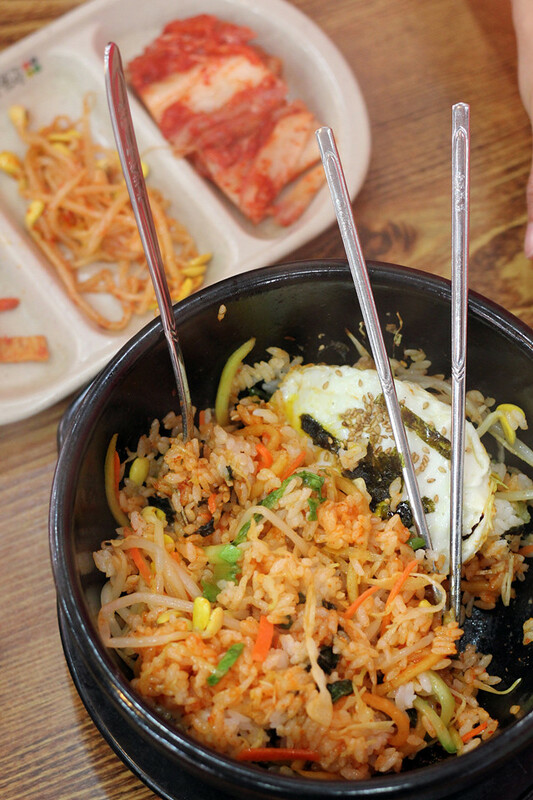 Dolsot bibimbap is served in a scorching earthenware pot so every bite is extremely hot in temperature. Be sure to start mixing it immediately so the rice doesn’t get too crunchy burnt on the bottom! 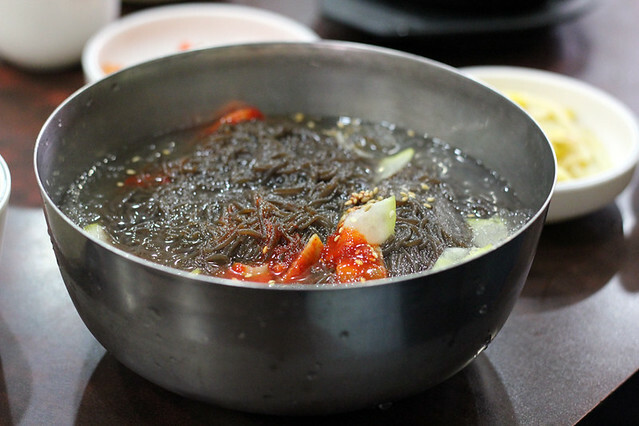 Similar to the Dolsot Bibimbap mentioned above, the cold variation is served in a metal pot. 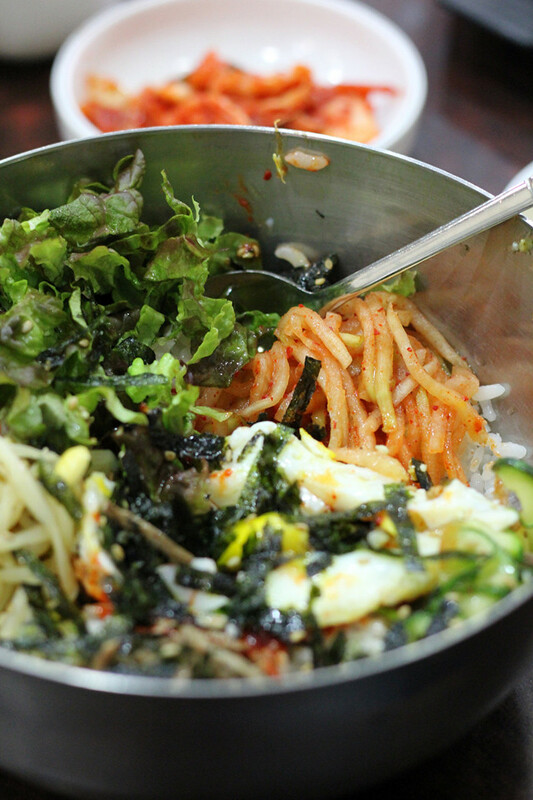 Mix all the ingredients together and bibimbap makes for a fantastic lunchtime delight. I enjoyed both the cold and hot versions, but given the choice, I preferred the scorching hot dolsot bibimbap. 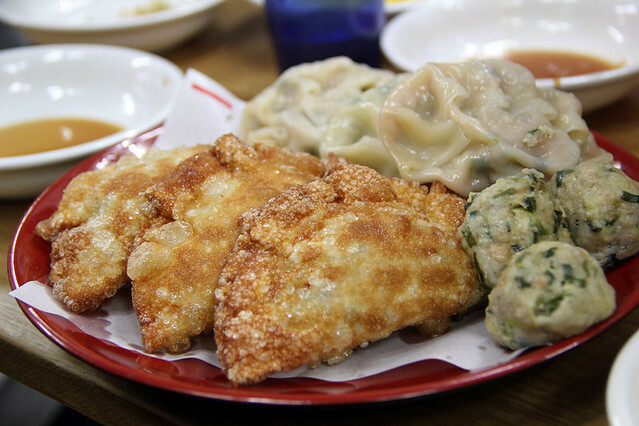 Similar to jiaozi in China or gyoza in Japan, Korean mandu dumplings are noodle like wrappers stuffed with a variety of different ingredients. Pork, onions, cabbage, carrots, and mung bean noodles are all common ingredients within these pillows of delicious goodness. 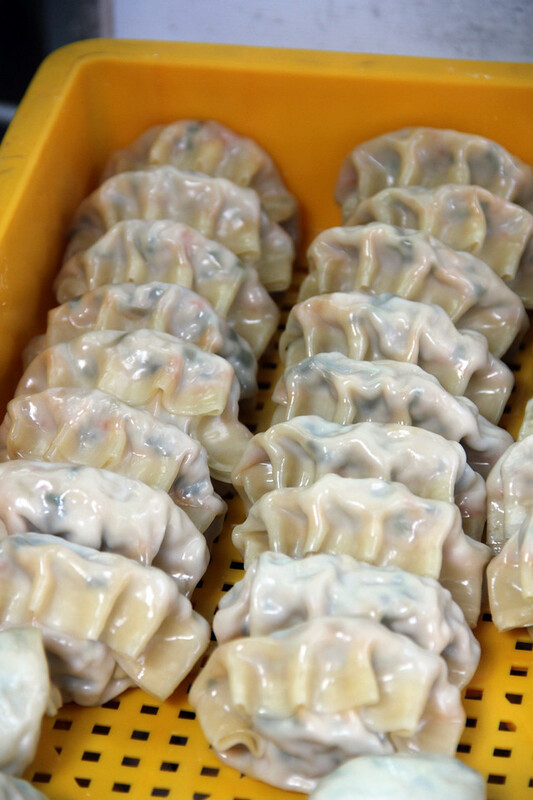 The steamed versions are known as Jjinmandu. Stuffed with pork, glass noodles and an array of salty seasonings, these deep fried mandu’s are guaranteed to be mouthwatering. They are most delicious when serving piping hot and dipped in the soy vinegar sauce provided. I was fascinated how South Korean food incorporates extremely piping hot dishes as well as extremely cold dishes. I’ve eaten cool noodles in China, but Korea is the first time I’ve ever been where there’s a noodle dish that’s actually served in ice. These buckwheat noodles are originally from Pyongyang in North Korea, but they are widely available in South Korea as well. I loved the gummy texture of the noodles and the sesame seed essence in the soup. Warning: I did get the shivers from eating this dish! Though every bite made me colder, I highly enjoyed this bowl of kimchi flavored bibim naengmyeon. The noodles were thin and chewy, topped with slices of cucumber, cabbage, a hard boiled egg, and a slosh of sour kimchi flavored ice. It was like a kimchi popsicle and it was delicious! Take South Koreas most iconic vegetable garnish (kimchi), stir fry it with a few chunks of hot dog or luncheon meat and rice, cover it with a fried egg and sprinkle it with toasted seaweed and sesame seeds and you’ve got a dish that no one could dislike! It’s the type of South Korean food that tastes good any day of the week or for whatever mood you’re in. Don’t forget to eat kimchi fried rice with a side of kimchi! I’ve always been a lover of stir fried translucent noodles. The Korean version is wonderful – chewy stir fried sweet potato noodles mixed with slivers of carrots, cucumber, onions, mushrooms and sometimes pieces of meat. 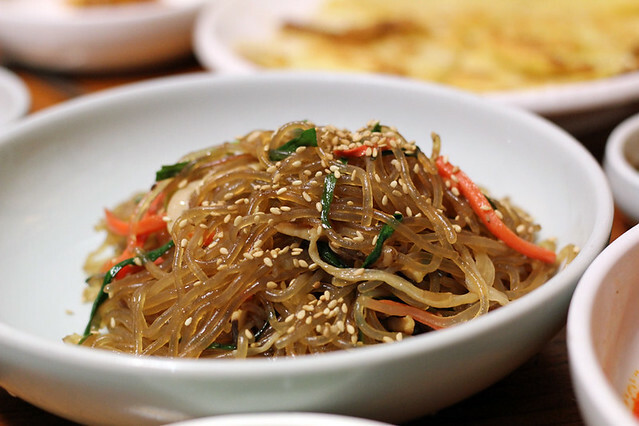 Fried in sesame oil and garnished with toasted sesame seeds, japchae has a mouthwatering fragrance that a taste you’ll love. South Korean food includes a variety of pancakes. These are not your ordinary pan fried hot cakes with a bit of syrup on top, Korean pancakes are salty, filled with tons of ingredients and fried in lots of oil! Among the selection, one pancake I really enjoyed eating, again at the Gwangjang Market, was the mung bean pancake known as bindaetteok. Made from ground mung beans, green onions and kimchi, this beauty was deep fried and served with a vinaigrette dipping sauce. 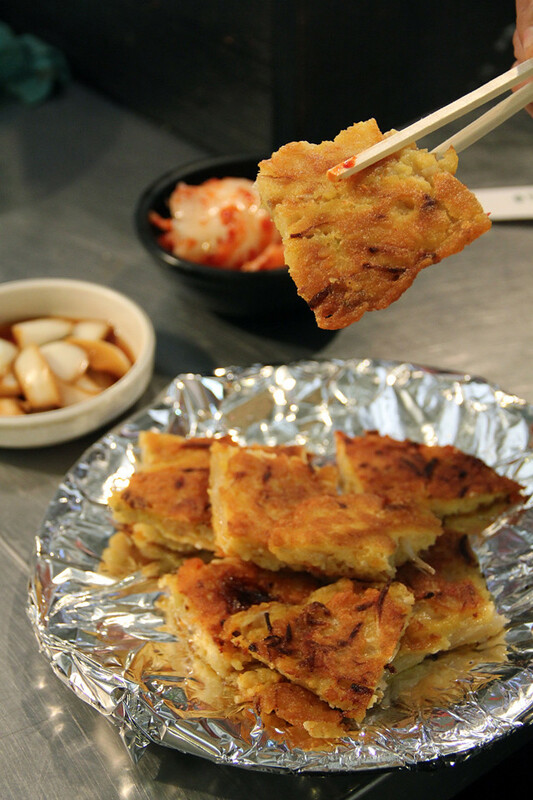 Eating Korean pancakes kind of reminded me of short eats in Sri Lankan food. 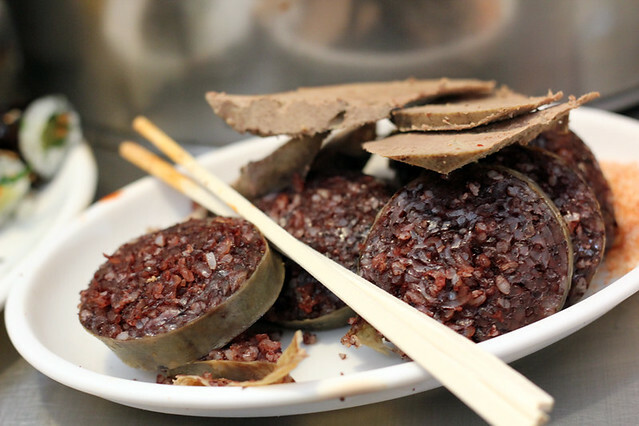 Blood pudding lovers… it’s time to rejoice – Korean’s take pride in their soondae (or sundae) and I’d have to say it’s nothing short of fantastic. This version I ate at the Gwanjang Market in Seoul was a masterful combo of sticky rice and pig’s blood stuffed into intestines and steamed to perfection. This Korean street food favorite is not for everyone, but if you’re a fan, you’re going to love it! This is kind of the chicken nuggets snack platter of modern Seoul. Not sure how long this deadly delicious combo has been around, but my guess is that it’s been a rather recent invention. I first found this dish in the bustling shopping district of Myeongdong at a chain restaurant. Spicy stir fried octopus, spicy daikon radish kimchi and plain rice and seaweed gimbap is a merger that was meant to be together. 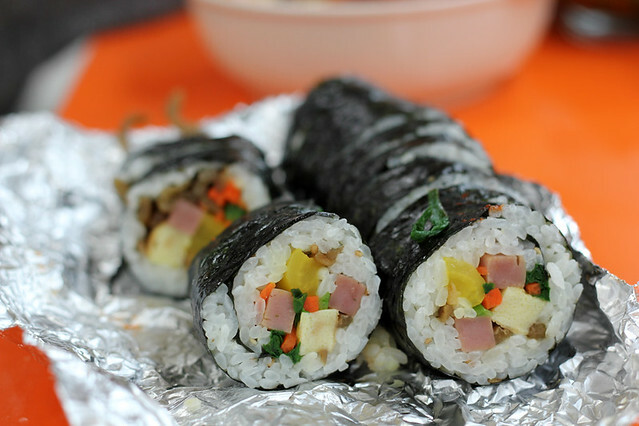 People in Hawaii took original Japanese ideas to create the SPAM musubi, and Koreans crafted the gimbap. Eaten as a meal or just an on-the-go snack, gimbap is one of South Korea’s most beloved foods. Similar to a Japanese style hand roll, gimbap is an assemblage of sushi rice, a few Korean pickled vegetables, spinach, and ham all wrapped in sheets of toasted seaweed. Gimbap can be enjoyed standing on the side of the street in a tent, taken away in a foil wrapper or ordered at many Korean restaurant’s. I’ve eaten a lot of grilled chicken in my life, but I’m going to honest when I tell you that grilled dakkochi chicken skewers is up there with the best of them. 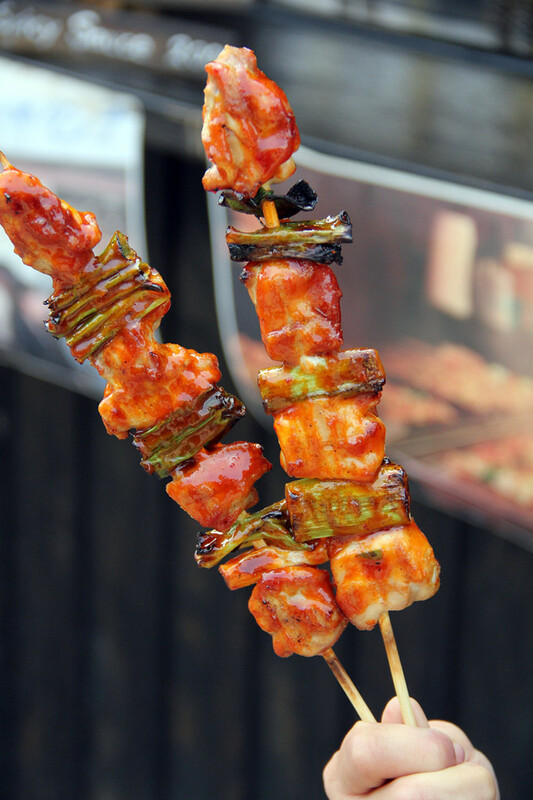 Similar to mishkaki in Tanzania but these skewers in South Korea are lathered in an outrageously flavorful red chili sauce that will make your close your eyes and leave all your worries behind. One of the joys of any South Korean meal at a restaurant is all the little side dishes that are perpetually served. Though there are a few standards like kimchi, it’s often a house speciality surprise as to what banchan you’ll receive. Though I stuffed in my share of banchan accompanying tidbits, this little bowl of curry pasted raw crab was one of the most memorable. The crab was tender and awesomely tasty when coated in the thick red chili paste. 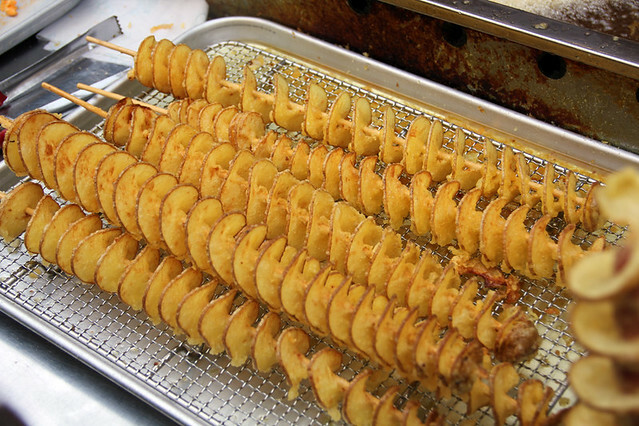 Take a potato, cut it into a spiral and spread it out over a stick. Then fry it in hot oil, douse it in a little MSG seasoning and you’ve got a very addictive treat. They even had a hot dog in the center variation – but I didn’t try it! 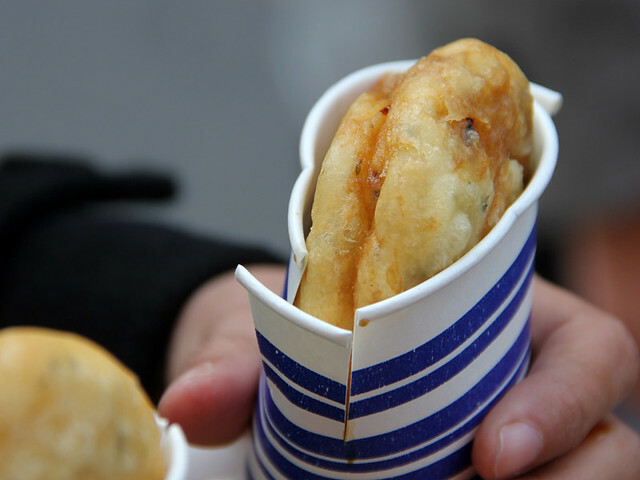 Purchased in the midst of the Bukchon Hanok Village in Seoul, these little deep fried treats were packed with tastiness. The vender had two options: One savory and one sweet. I preferred the salty version, a crispy thin gooey outer layer filled with glass noodles and garlicky pork! Unless it’s for health purposes, there’s not much to dislike about crispy deep fried things. 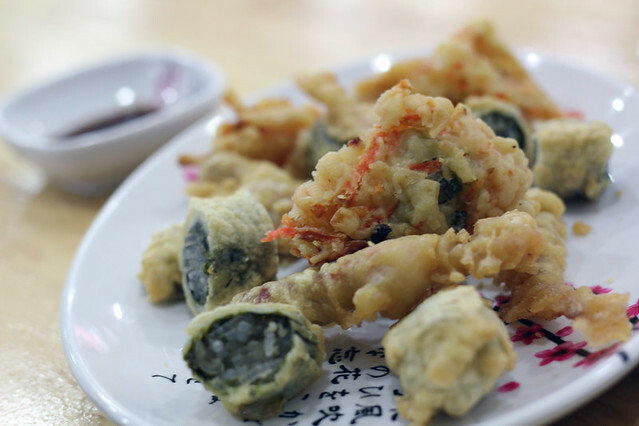 The Korean version of tempura is made from a variety of different vegetables, squid and even rice that’s coated in a thick batter and deep fried until it becomes wonderfully crunchy but delightfully tasty! 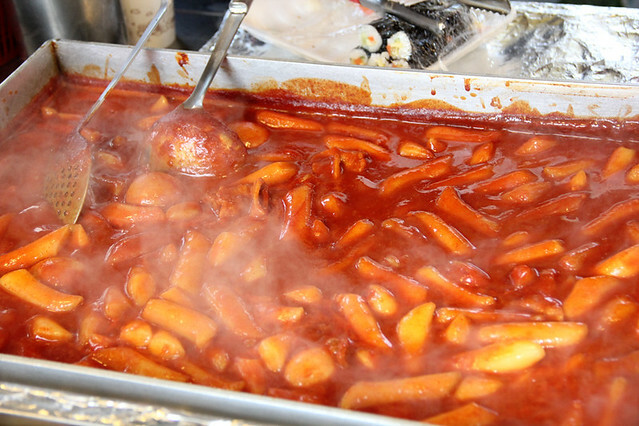 If you’re hunting for Korean street food, tteokbokki is likely the first thing you’ll discover – it’s everywhere in Seoul! It’s the poke bowl of Seoul – a dish that’s common, easy to eat and fabulously tasty. In Seoul for just 2 weeks, I was only able to eat a fraction of the South Korean food possibilities available – but what I did get to eat was extremely delicious. My mouth is still drooling as I write and think about Korean food right now! 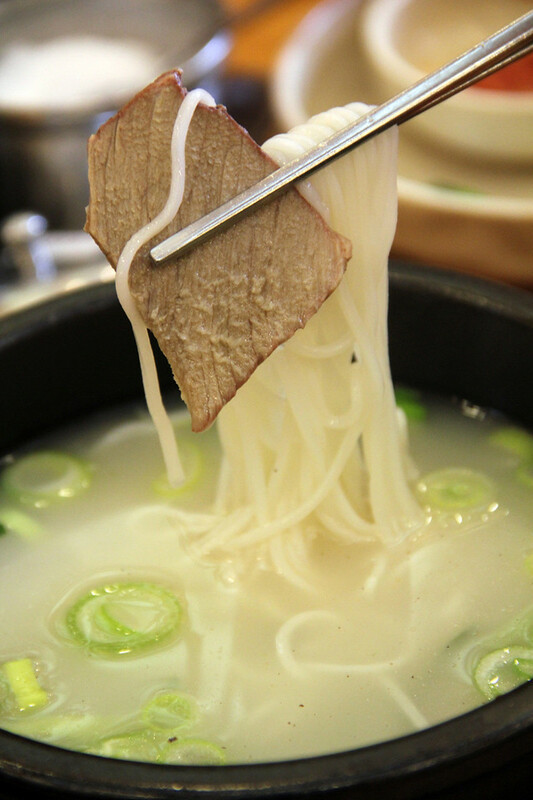 What’s your favorite South Korean food? P.S. By the way, next week Tuesday I’ll be publishing a round-up of my favorite Korean street foods I ate in Seoul – don’t miss more Korean food! 129 comments. I'd love to hear from you! SHOWING ME SUCH GREAT LOOKING DISHES. I LOVE CHINESE FOOD, BUT NEVER KOREAN,,,, THANK YOU.. MARGE HESS HERE. Dolsot bibimbap!!!! Nomu nomu masshisseoyeo!!! I love their army soup and their gogigui! Oh man! I love Korean food. My roommates were Koreans and their mother loved me. She taught me so much. I wish I would have went with my husband to South Korea the three times he traveled there. I tried korean food in korean festival which was held in my city. I tried tteobokki, japchae, kimchi and bibdatteok. Tteobokki n japchae was amazing…still can’t get over with it. Kimchi was very sour for my taste but I want 2 try it again. Korean Food tastes so GOOD!!! Glad you love it Roger! Don’t get me wrong to asked this..??? ?✌️ Then y u don’t go back to korea? Is that ur native country? ✌️???? Learn how to spell, and then come back and ask this question. I want to go korea and try thier foods. Looks delicious! DAK KALBI IS THE BEST! I tried to make it here in Canada by myself, but it is so much better back in Korea. OMG, my mouth was watering when i saw each Korean Food. I’d love to go to Seoul and try them. Why Rameon is not in the list? Wow awesone im craving for those kind of dishes i really love korean foods specially kimchi oh God I cant help my self to search more korean restaurant. Thank you for reading Abhie-ghail, hope you can get some Korean food soon! hello is south korea food nice, because i thhem doing a project. Hey Lindsey, thanks for the recommendation, that sounds delicious. When I was station in tongduchon korea in the village they had a white rice dish with a egg on top but the taste haunts me it’s so good the taste just wants you to keep eating. Found small mom and pop korean restaurant in Newport news, va. But they’re probably closed just need ingredients to try to make. Hey Robert, thank you very much for sharing, that sounds great! Buddy I can’t believe you left out samgyetang 삼계탕!!!!! That is by far the best Korean Dish out there!! A hot bowl of samgyetang on a cold Korean evening with a plethora of accompanying side dishes is absolutely life changing. Great job listing everything else though! Ahhh this made me hungry, I wish I could have Korean food every day! I haven’t tried all of these dishes yet, but my favorite so far is dolsot bibimbap. I love the banchan even more (KIMCHI IS AWESOME). Well tho i have never tried their food but i wish their ingredients were available at our local area so i could get the chance to cook them and eat cause they sound delicious…. Hi Mark. Huge fan of your blogs. It was particularly helpful during my solo Japan adventures. I also share a lot of your videos with friends who are looking to travel. 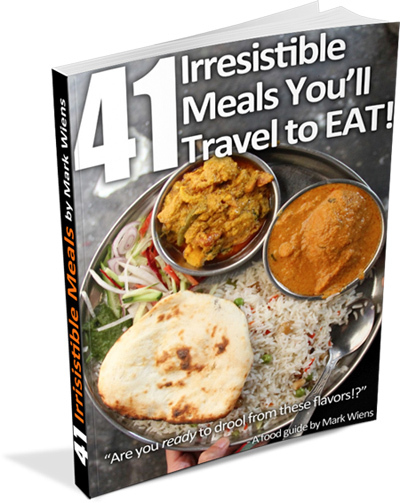 Like you, I travel for food as well. Do tell, all the dishes listed above are best enjoyed at one of the markets? for eg – Gwangjang Market? or are there specific eateries where these need to be tried at in your opinion. I look fwd to hearing back from you buddy. I just wanna say thank you for your writing. I am Korean also I studying in America . I didn’t really know about y’all taste . But when i finished to read this writing , I really glad that you like Korean stuff. Anyway Thank you! Hey Eric, you’re welcome, thank you for reading, glad it’s helpful! Really enjoying your videos, keep going! 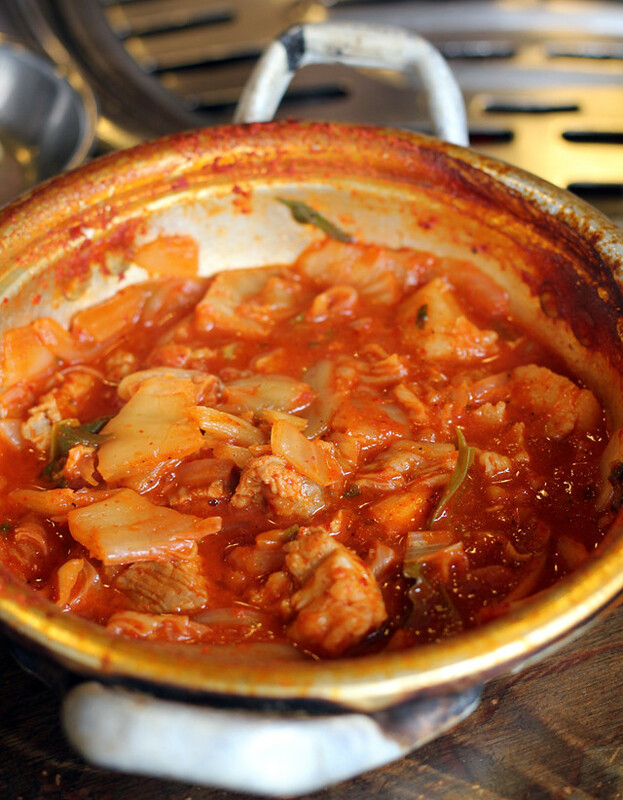 I think you would like a dish called “Gopchang Jeongol” it is very spicy as well. Your genuine love for food is quite awesome! Hey Robin, thank you very much, will try to taste that next time I’m in Korea. Good to hear that, glad you love Korean food! Good to hear that, glad you still enjoy Korean food! nice! .this is more help full to me .last year i see your video about Bangkok before go to the Thailand it is so helpful tome when i was in Bangkok. Im from korea and I live in spain… missing the food so much can’t wait to give presentations about Korean food in class!! haha I am so proud we have so much variaty of food. Hey Young, great to hear from you. Good luck with your presentation! Yours is a pretty solid list, though i’d have to add KongNameul Gook and DoaenJang Jiggae! Both are yummy and the latter is also a popular hangover dish! Hi Nana, thank you so much for the extra recommendations, sounds delicious. I can’t wait to visit again to eat more delicious food. You have to tell people you like spicy food to get a fuller range of foods. Many in Korea don’t think foreigners can eat spicy food, even Kimchi, which isn’t even that spicy. 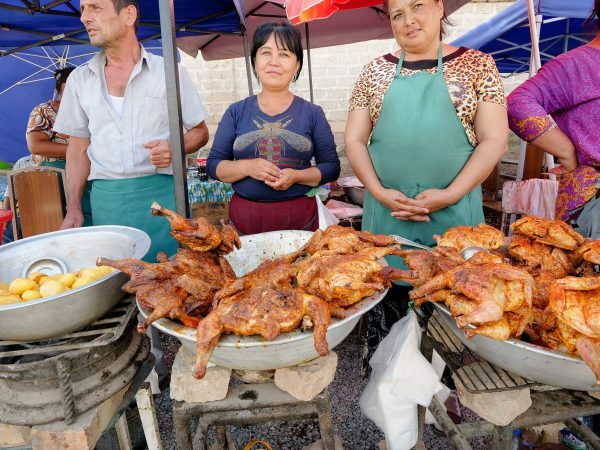 Try fire chicken (bbul-ddak) or chicken gizzards (ddak ddong jip) For the best tasting dishes, don’t go to the ones they recommend to tourists. Try a few dive places. They usually have the best food. The ones they recommend to tourists are less flavorful to accommodate what they think foreigners can eat and what they can handle in terms of spice. It’s recommended that you go along with a Korean since you won’t get English translations in their menus. Great, thank you for the recommendations John. I really hope to return to South Korea again to eat in the future! Thank you for this post and it made me feel so excited and looking forward for my trip in Korea this April. Do you have any list of local restos where you tried all these food? cause from your post you did not include the restos you went to. Thanks! Hey Jhes, I haven’t written a full article roundup about the places I’ve eaten, but I did write about a lot of individual places. Check this link here: http://migrationology.com/tag/seoul/ Hope you have a great trip! Thanks Rob! I often use a 50 mm, but also have a 17 – 50 2.8 which is my favorite. Doenjang Jjigae: Korean bean paste and tofu soup. 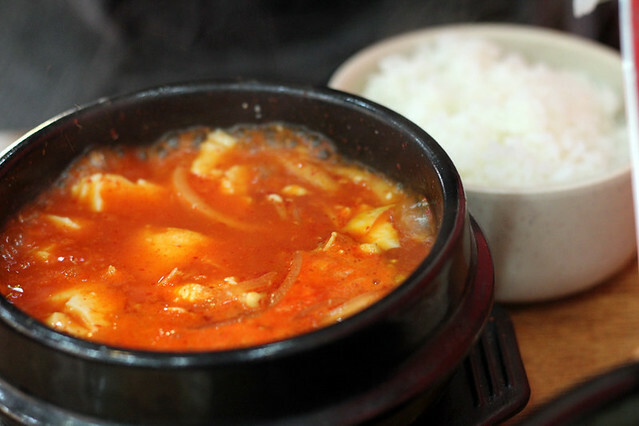 Doenjang Jjigae is another bean paste and tofu soup, spicy and served normally with many vegetables and without a meat. However most places offer to add pork or beef for a little extra. I also mix-in a couple of spoonfuls of sticky rice to make it last longer. I just can’t stop eating it. Yum yum! I call it the soul of Seoul. Hey Zara, I have had it, but didn’t manage to try it while in Korea. It’s good! No problem Sook, glad you enjoyed it and thank your for leaving a comment. 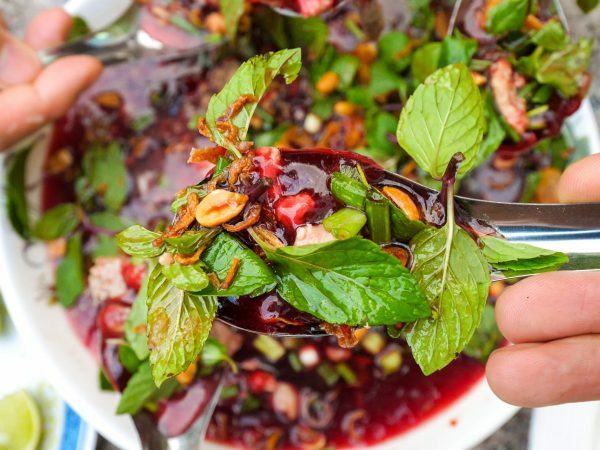 Hope you can eat all of these delicious foods soon! That seafood soup looks delicious! I’ll admit that the first few times I had Korean food, I wasn’t very impressed. It didn’t seem to have the same vibrancy of flavor that other Asian cuisines had, but the more I’ve tried it, the more I’ve come to appreciate it. I think the fact that I’ve been upping my spice tolerance gradually has also helped! Plus, I used to hate kimchi, but now I quite like it, and given how central kimchi is to Korean cuisine, if you don’t care for that, you don’t have much of a chance! Looks like Seoul did not disappoint on the food front! Right about kimchi Steph, if you don’t like it, it’s a huge part of the cuisine. Glad to hear that you’re now liking Korean food more and have upped your spice tolerance! Interesting list. As an expat teaching English in South Korea, the list is pretty good. But you get a completely different experience being outside of Seoul. Seoul has all the Korean dishes but not so much of the “home cooked” and authentic feeling that you get in smaller cities and towns of Korea. The list more accurately reflected the most common Korean foods for expats to eat in SEOUL, not the best foods in South Korea. I think a more well-rounded list would mean venturing outside of Seoul and trying the less common dishes, but regardless, the food on the list is all super tasty! PS- I don’t trust a list without kal guk soo (칼국수), duck on a spit, dog, jajangmyeon (자장면), chicken galbi in combo with ddeokbokki, korean double-fried spicy FRIED CHICKEN (crazy delish) or even ramyen. Thanks for sharing your thoughts Kaylee! I understand, this list is by no means complete, it’s merely what I was able to eat when I was in Seoul for about 2 weeks. No, I didn’t get to try everything and I had to hold back on quite a few things because it’s so expensive in Seoul – but these are the things I got to taste. Thanks for adding more dish recommendations! I really love the cold buckwheat noodle soup! That was one of my favorite things! Although none of the ones I had were served with ice; they were just cold. Thanks for sharing Laura, it really was interesting but delicious! Hi Su, wow, thank you very much for sharing. I would love to try it in a bowl made of ice! Good list! I’ve lived there for a little over a year and you’ve definitely tried more food than me. Although I’m most veggie, there are still a lot of things here which are accessible. Nice photos and impressive hangul. Thanks Christine! Good to hear you’re living in Korea. Do you do a lot of your own cooking? Are you able to find a lot of vegetarian food in Korea? Haha, thanks for checking this out! Ahh, great, thanks for sharing that Naomi! Whenever I ordered it I tried to mix it as fast as possible so the crunchy rice wouldn’t get all stuck in my teeth, but added with some hot water that might make a good soup! Mmm, now I’m hungry for lunch. School lunches is Korea often incorporate these dishes, and as a teacher I get to eat them daily! (of course, there is always, always kimchi of some sort). 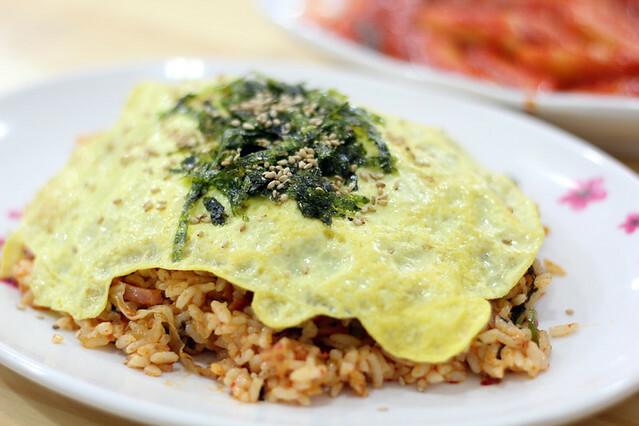 Kimchi bokkeumbap (fried rice) and sweet hotteok are my favorites, along with dalkgalbi (spicy chicken barbecue). I walk by a samgyeopsal place every day and even the fumes smell greasy (and mouthwatering)! I’ll miss Korean food when I leave. Thanks for sharing Rachel. Mmmm, school lunches in Korea sound fantastic! I’m so obsessed with daeji bulgogi! The flavor is unreal. I hope I get to try banchan in my lifetime. There is almost nothing I love more than deep fried potatoes. Awesome to hear that Ava, I’m also quite a fan of daeji bulgogi as well! Those stews look delicious! It sounds like there are a lot of hearty meals in South Korea. Korean BBQ also gives off amazing smells… Now, I have a craving. Yes it does Lane, an intoxicating meatiness! Yes, Seoul really is a great city Laurelle with so much to offer and such a great food scene! Wow. This post made me so hungry!! I love Korean food. Very much! Most specially Kimchi!!! I eat Kimchi almost every meal. Haha And Gimbap, Japchae, cold Bibimbap, Dolsot bibimbap, Kimchi Jjigae, etc… Oh man! I really wanna chow!! Awesome to hear that you also love Korean food! What you named off all sounds delicious – I’m also a lover of everything kimchi!